This dish is inspired by my recent trip to Kuala Lumpur and my quest to find the perfect Nasi Ulam. Everywhere I went, I looked for Nasi Ulam and/or Nasi Kerabu. I went to several places, and I would say that it was an incomplete/unsatisfactory quest. I did manage to eat Nasi Kerabu, and a Kerabu Fried Rice, but I felt like it could be better. I managed to buy a few herbs (but did not take any pictures, silly me!) 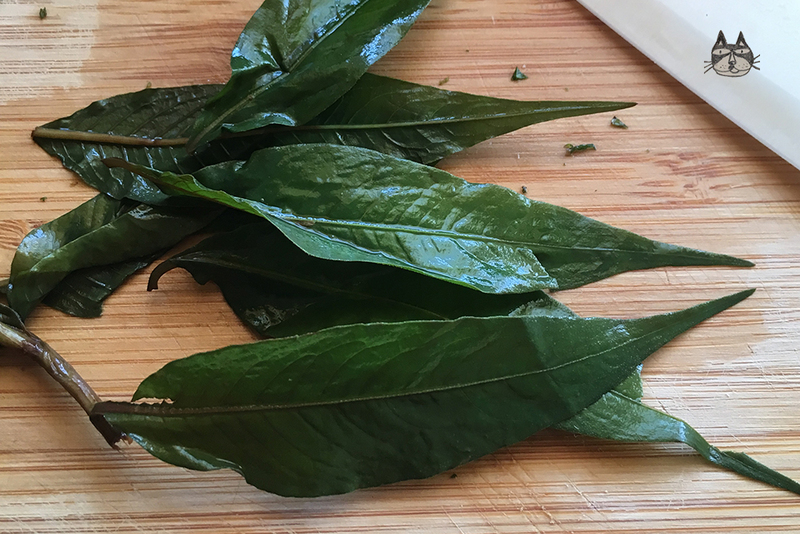 from the supermarket in Malaysia before I left – Ulam Raja, Vietnamese Coriander or Daun Kesum (pictured below) and Daun Pegaga. I couldn’t find any Bunga Kantan (Torch Ginger Flower), and according to my mother, Nasi Ulam without Bunga Kantan is incomplete and not authentic. So, no Nasi Ulam post anytime soon (unless I can find Bunga Kantan here in Athens in the next few months… say I wonder if there is a way for me to grow these here? ), so I will have to make do with an ad-hoc Nasi Ulam-inspired dish. I have not included any of the hard-to-get asian herbs and salads because I will save them for the actual Nasi Ulam recipe. Flavours are quite strong and fragrant for this side dish – and the rice used should also be fragrant. I recommend jasmine or basmati rice. You will need to season the rice when you are cooking it. 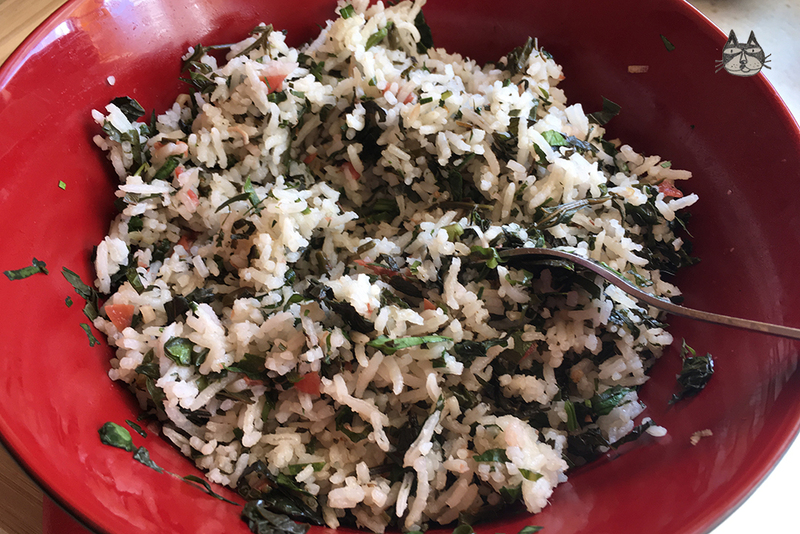 Additional salt and seasoning may be required when you mix the rice with the finely chopped herbs and salad. 1 cup of basmati or jasmine rice, rinsed clean. Optional salad and herbs can be added, just make sure that they are sliced thin and fine. Cooking the rice: In a pot, heat the olive oil on medium low. Once hot, gently fry the uncooked rice, coating all the rice grains with olive oil. Season generously with salt, and stir continuously until the grains get slightly translucent. Add the hot water to the pot, and stir. Cook until you see the little crater holes appear at the top of the rice, and turn off the heat. Cover with a lid, and let the rice steam for about 10 – 15 minutes. 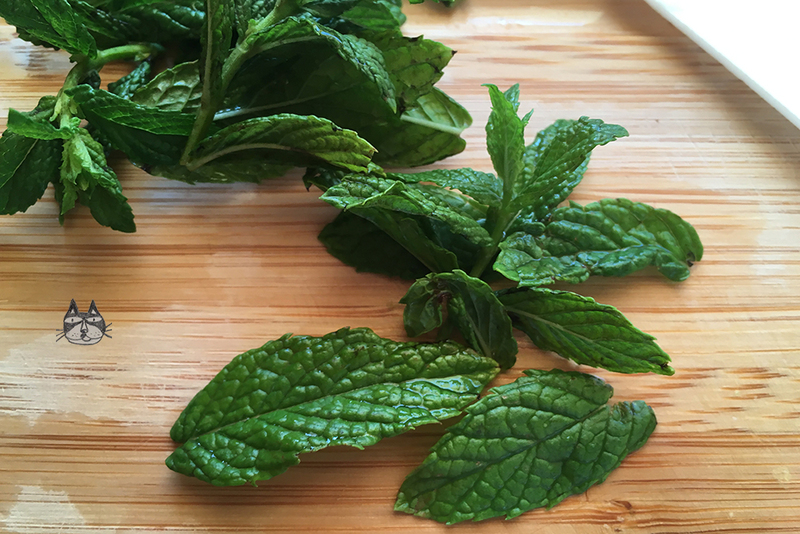 In a big bowl, combine all the herbs and salads that you plan to use, and mix thoroughly. Once the rice is ready, add the rice to the vegetable mixture, and mix thoroughly. Serve as a side to a main dish – it goes very well grilled meats and fish, or as I did with Chicken Umeboshi.